Description: Perennial herbs, tufted or with creeping rhizome, monoecious, more rarely dioecious. Culms mostly trigonous, rarely noded above base, often covered at the base by persistent leaf sheaths or their fibrous remains. Leaves mostly basal, 0–several cauline; ligule present. Inflorescence panicle-like, raceme-like or spike-like, more rarely reduced to a single spike. 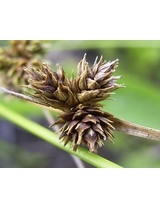 Spikes 1–many, terete, sessile or peduncled, with few–many spikelets, wholly male, wholly female, or bisexual; involucral bracts leaf-like or occasionally glume-like, sometimes absent. Spikelets unisexual, consisting of a solitary flower, in the axils of the spirally arranged glumes, in some species ( the Uncinia clade) with hook-like tip of rachilla protruding beyond the perigynium (utricle) in the female spikelets. Stamens 3. Gynoecium enclosed in a bottle-shaped prophyll (perigynium or utricle); style 2- or 3-fid, protruding through the small terminal mouth of the perigynium/utricle. Perigynia (utricles) membranous, papery, leathery, or corky, 2-keeled, narrowed to a beak with truncate or 2-fid apex. Nut trigonous or lenticular, enclosed in perigynium (also known as a utricle). Distribution and occurrence: World: >2000 species, cosmopolitan, mostly outside the tropics. Australia: c. 86 species (c. 30 species endemic), all States except N.T. The tribe Cariceae is currently being studied world-wide by the Global Carex Group and all genera (including Uncinia) are now included in an expanded monophyletic genus Carex - see Global Carex Group (2015 - DOI: 10.1111/boj.12298) for details. The inflorescence structure is complex in this genus. What are here termed spikes and spikelets have in the past often be called, respectively, spikelets and flowers. Note: glume length includes mucro; perigynium (utricle) length includes the beak (which is described in the terms used by Jermy et al., 1982); leaves are often not obviously septate-nodulose until dried. The axis of the spikelet is conspicuously elongated beyond the apex of the perigynium, ending in a hook that walkers know all too well, in species formerly included in Uncinia. The online key is based on the updated key published in Telopea 6(1): 573-577 (1996), plus correction in Telopea 7(1): 95 (1997) and later updates, including the addition of species formerly in Uncinia. The European species Carex divisa is included in the key but no description is given since it is not known to have become naturalised in NSW. It is, however, naturalised in Vic, Tas, SA and WA so could occur in southern NSW. Hybrids seem to be much less common in Australia than in the Northern Hemisphere. Leaves 0.5–1.8 mm wide; culms mostly smooth below inflorescence, 0.2–0.7 mm diam.